Yes, I will definitely be bringing it to Texas once I get it finished. I would do 35s for sure to gain as much ground clearance as possible under the frame since its a longer wheelbase truck. Another option that would be perfect for that wheelbase is run a doubler. I just seen on one of my Ranger FB groups someone is making the shaft and plate to build a 1350 doubler again ,just like I have in my Truggy. I'm going to use this as more of an adventure rig. I hate to lose the climbing ability it has now, but not quite sure I would get a lot of use out of the doubler. Playing around with a new paint scheme idea. My paint scheme has always been a play on the Ford Rough Riders paint scheme. This time instead of all the stars, I'm thinking just one big star on each side, and making the red stripe curve, instead of coming to a point. But unlike how the Rough Riders pattern goes across the hood, I'll continue the blue with the red stripe all the way out to the headlight like the original TRS-2 paint job. I need a tailgate that's in good shape to fit my 1996 Ranger. I also need the bolts and latches that attach to the bed that the tailgate latches on to. Mine are gone. I want the tailgate so I can use it as a bench/counter/table when I'm camping. I also want to remove the spare tire from my cage, so I can put a 12-volt fridge in between the cage and have access to it. It would be great if I could put it on a slider, so I can pull it out to get in to it. This means I need to relocate the spare tire either back under the bed, or on a new rear bumper with a swing out tire carrier. Honestly with the time crunch for the anniversary, and the other things I need to get done, the only way I could probably do a new bumper and tire carrier is if I found someone that could help out and build it for me. I'd still like to see if there would be people interested in coming over on a weekend this spring to help do some work. 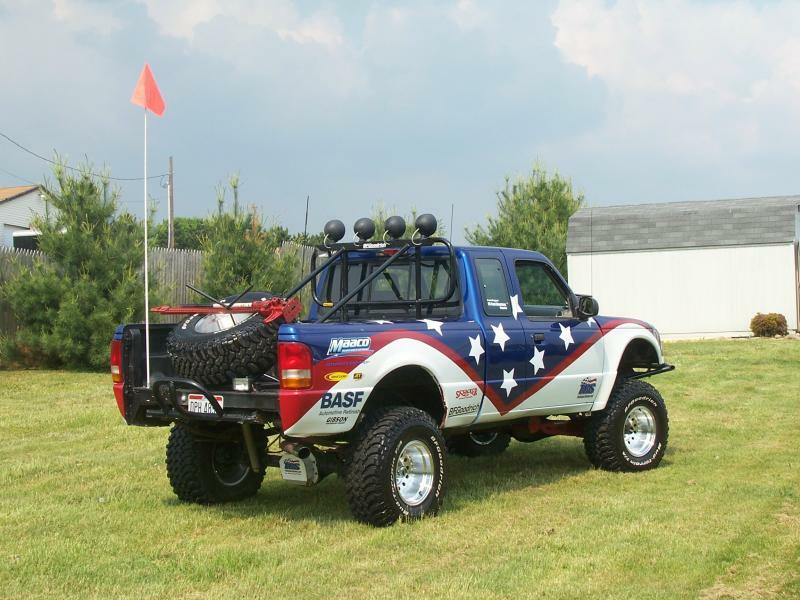 The Ranger is in Dennison, Ohio 44621. That gen of tailgate is abundant on Ebay and Craigslist. I would absolutely come help if I was closer. All I can do from here is offer encouragement. You got this! If you put the work in, you'll get the results. Same, wish it was closer. I'm only an hour from there just outside of Akron. Ill see what I can do to help Jim!! I think I have a clean 98 green tail gate that may still be in decent shape. Also I do have a 200 amp tig and a arc machine as well. I'm trying to find a decent smaller mig here soon. I do have a whole 98 single cab to rob parts from. (Its wrecked though in the front). Post up a date when you'll be coming up and I'll do what I can to be there. about 1.5 miles from 250 on north on 151. my truck is in the yard so you cant miss it....same one i was in last time i met you..
plan for this week is to put front axle parts/lockouts in and hot test/ load test the power-train before tearing into it. i was wanting to build a little work bench and stuff before tearing into it...garage is plain jane so any tools are welcome. Really starting to wish I hadn't sold my chop saw and tubing bender. I need to build a new rear bumper, and reposition the spare tire. tubing bender not too far away though. pretty sure pottsy still has one too. mighty ford.....i work nights....12-15 hrs depending how far away and 7 days. not sure if you have my number. i am on a few phones since i last talked to a..same number though. I work 2nd shift currently 6 days a week. I just bought a 02 ext cab to build. Its not legal yet. But I'm working on all that. I think I need to toss a clutch in it. But once its good enough to make the trip down. I can load up some welders. I'll see what I can do about bringing some DOM with as well. One question though...will we have heat?? Also Jim check your PM box sent ya one. Oh and I maybe able to bring some kind of a work bench as well. I'll have to score a trailer from my brother. The more I think about the truck, the more I start losing sleep trying to come up with a plan. One of the things weighing on my mind is the engine. I replaced the original motor back in 2014 with one from a 1996 Ford Explorer. I have no idea how many miles are on the engine, but I know Bobby said it has a leak at the cylinder head. I haven't been reunited with it it. I plan to go out and tear in to it this spring. Other than being stock, the motor has a Jet Performance Module and Borla exhaust. This assumes that the engine is in good mechanical condition and just needs freshened up with gaskets, seals, oil pump, and timing set. This doesn't include motor mounts and all the other things that might be needed? Will also need some driveshaft mods. I know some of you may think you should just replace everything with a V8. I've been very please with the performance of the 4.0L. I've had a 302 Ranger 4x4, and they're great for throwing mud, so I know the benefits of a V8. I want a reliable truck that I can travel all across the country in. Anyone have any advise as to why I shouldn't just overhaul the 4.0L in it now? ?